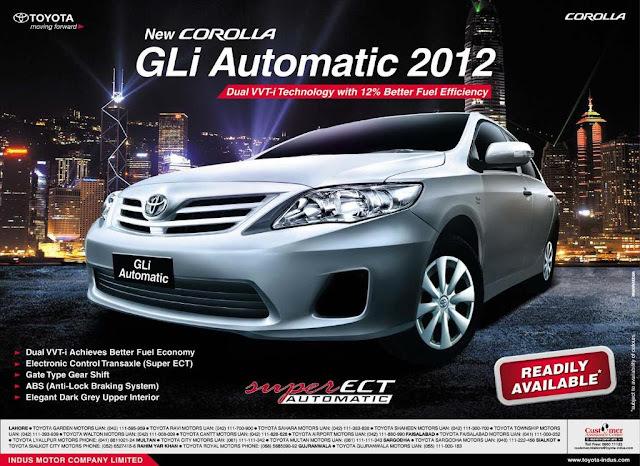 Toyota Pakistan or Indus Motor Company has Introduced the all new Corolla GLI Automatic 2012 Model in Market. Innovation in Technology: The New 1.6 Corolla GLi A/T, Altis A/T and Altis A/T SR features the latest and most innovative technology which focuses on improving fuel economy and driving efficiency. 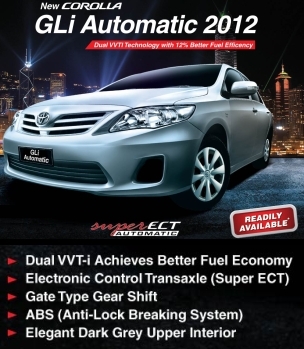 The New Dual VVT-I Engine has been introduced first time in Pakistan for 12% better fuel efficiency. The new Backlit Optritron Meter creates an elegant appearance and enhanced visibility. 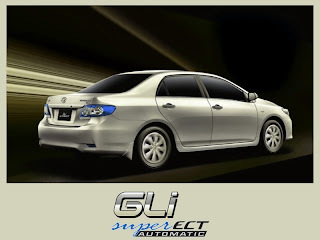 Now Introducing Gli Automatic: Corolla Gli is a Pakistani Sedan and Indus Motors Company (IMC) is claiming that it has sold over 75,000 units since its introduction in 2003. 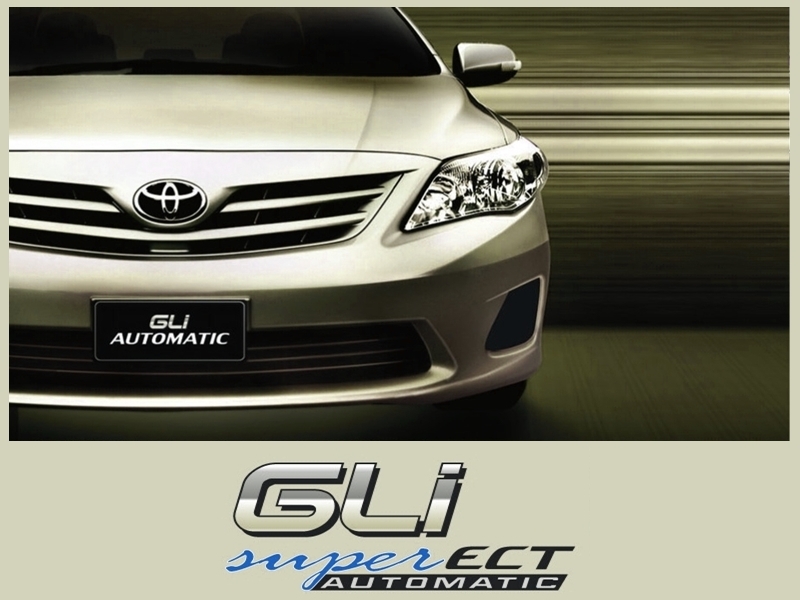 Indus Motor Company is pleased to announce the introduction of Gli Automatic with 1.6 Dual VVT-I Engine and Eco-Lamp. 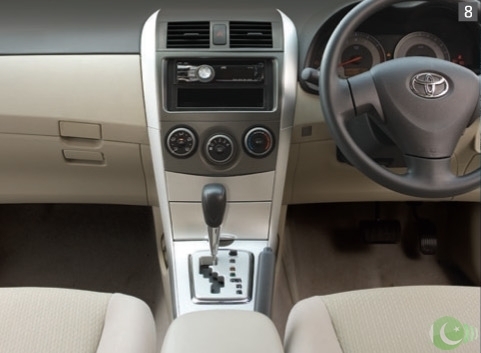 The Manual Transmission Corolla Altis feature 6 Speed Gear Shift which creates a dynamic driving experience and balanced performance. 1. 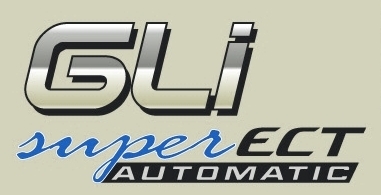 Electronic Power Steering for a smoother drive and better Fuel Economy. 2. Powered Windows, Mirror and locks. 3. Rear Flat Floor to enhance leg room. 4. Two Separate dash board Copartments. 5. Whiplash Injury Lessening (WIL) through active headrest. 6. 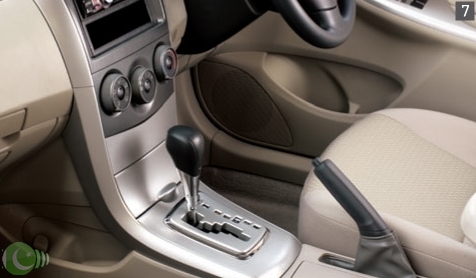 Anti-Lock Braking System (ABS) prevents wheel lock ups when braking on hard or slippery surfaces. 7. automatic Gear Shift with Silver Paneling. 8. New Dark Grey Upper Interior. 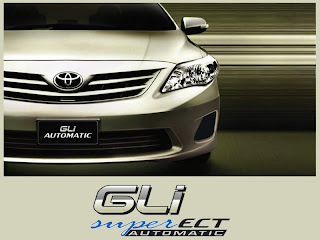 Earlier I had reported about the launch of Toyata Corolla EcoTec in Pakistan and now the introduction of Automatic Gli 2012. This is just a news, for complete details, delivery dates & timings you can visit Toyota Pakistan Website.